But in the United States we have a different problem – a very large illegal immigrant problem of our own and it’s been targeted by those I often politically agree with as dangerous to our national security. Their proposed solutions have been to shut down our borders and arrest the illegals and ship them back. But the resolve of our law enforcement to do that has been minimal, except from time to time for a few staged events, but nothing substantial. Why is that? I am convinced that “illegals” are not the major problem. The major problem is ourselves. The “within” is not just within our borders, the “within” is inside ourselves, our own faith, our own moral courage, our own lifestyle choices. The “illegals” are the most visible scapegoats for the real problem at hand and that is that they are here to support our extravagant lifestyles. We seem to forget that the Islamic terrorists entered the United States not through a compromised Mexican border, but with passports in hand, looking quite well-dressed and non-threatening, through airports crossing the Canadian border. The threat is not from outside ourselves, but from inside ourselves. The ability of our enemies to exploit that threat, including our innate American fear of foreigners, is masterful. But the problem is far deeper, just as culturally significant, and one that draws a line in the sand concerning our Christian faith and our American lifestyle. The British and American people have been on a spending spree like there is no tomorrow. Cultural and institutional nihilism has settled in. There is no outside force to blame for our own lack of resolve. It’s our own fault. Our situation will not improve until we take responsibility that it is our own resolve that is at stake to win the war on terror. Our own complacency is at fault for the lack of our governmental leaders to follow Winston Churchill’s example and take the harder, narrower road. Look at how millions are falling and fainting over a candidate in the United States that is preaching appeasement and the promised gratification of the nihilistic desires of spoiled Americans. We should be appalled and the only way to snap out of it is to imagine that tomorrow is another 9-11 (which we live with constantly in DC). 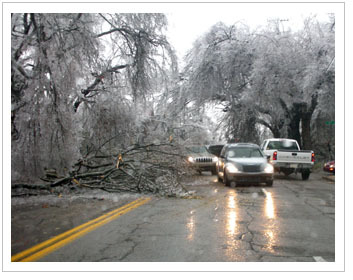 In fact, our recent ice storm was a wake up call for us that we are completely unprepared for a catastrophic emergency. We have been lulled back into thinking all is well and we can’t even handle ice on the roads. The vast majority of the “illegals” in the US are part of what is supporting our exorbitant lifestyles. They are victimized by our need to have cheap labor on the fly. That is our fault, not their fault. Shutting down the borders will do nothing if we keep building the McMansions that need to be clean with grass to cut. Frankly, I think every time we see Britney Spears melting down on national television, we are seeing an inkling of what is melting down in our own resolve. She is filled with despair and the American and British lifestyles seem to be equally based on such despair. We live as if there is no tomorrow. The candidate in question has tapped into that despair, but instead of serving the hard truth, he’s serving what we want to hear – that all is well and we are well and if we believe we are well, the horror will go away. Yes we can. The British are just a little ahead of us. It is wise for us to take this warning very seriously. The Ice Storm Commeth. If Rowan Williams – inadvertently perhaps – has helped us to wake up, so be it. God bless him.